There are some moments in Buffy the Vampire Slayer #3, where despite the alternate version of events and characters, writer Jordie Bellaire manages to capture some of the feel and magic of the show so very well. Two such moments occur based on discoveries Buffy makes in this issue. The first involves the creature released by Drusilla from Anya's magic shop, which despite its fearsome visage is actually a friend to the Slayer and her mission. 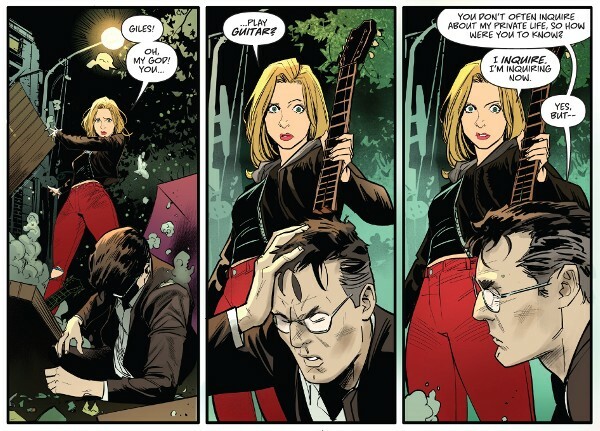 The second is Buffy's shock at discovering that Giles plays the guitar... in public. Although Camazotz goes back into the bottle, I'll be curious to see just what role it may have in the future. The Scoobies continue to show a bit more resilency out of the box than in the original series and Willow and Xander show up to help Buffy, and Cordelia Chase steps in to help fight the big monster (although after the adrenaline wears off she's less than happy with the trouble Buffy "brought" to town). The issue also offers the first meeting between Buffy and Spike and some foreshadowing about plans Drusilla has for Sunnydale and the Slayer's friends. Worth a look.